This is one of my most requested recipies. It is awesome and easy to make. The trick is to make sure to cook it until the liquid has been absorbed. Although you might want sauce, if you stop cooking before the liquid has been absorbed, the tempeh has a spongier texture. This has a wimpy heat index, so up the crushed red pepper if you like it hot! Or you can add some of those little hot peppers to the pan. I have also added veggies like onion, pepper and even fruits like peaches and tomatoes. Go crazy! 1. Cut tempeh into pleasing bite sized pieces. 2. Mix all other ingredients together. 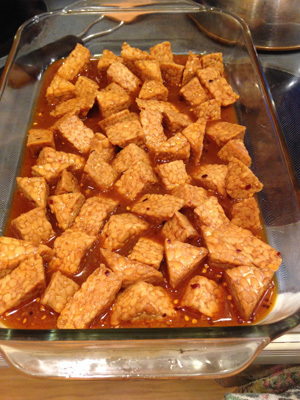 Add tempeh and marinate overnight. 3. Preheat oven to 350F. 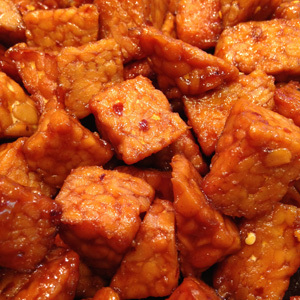 Place tempeh and marinade in 9 x 13 pan. Bake 30 min, turning every 10. Serve over rice & veggies.